The Mayor of London’s Cycle Superhighway along the A3 in Lambeth is set to launch on Saturday 17 July. Watch out for more information on the Lambeth Cyclists email group or see www.tfl.gov.uk/cyclesuperhighways. The TfL London Cylcle hire scheme is also set to launch at the end of July. Bikeweek takes place across the UK from Saturday 19 June to Sunday 27 June 2010. In Lambeth we have arranged events through the week. All events are leisurely rides and suitable for everyone. For other evants across London and the UK see the Bike Week website www.bikeweek.org.uk. Join us for a short ride to Bromley for the inaugural Bromley Bike Blast in Norman Park, Bromley – an all day event for all the family with competitions, bike parades, free bike repairs and much much more! This event is being co-ordinated by Bromley Council working with the Bromley branch of LCC. Join us for a leisurely ride to the magnificent Richmond Park via Wimbledon Common and other leisurely cycle routes in South West London. We'll aim to have lunch in the park, probably at Pembroke Lodge. Join Southwark Cyclists for this celebration of the longest day of the year. The leisurely ride starts are 2:30am (Monday morning) and takes in a Frith Street cafe before seeing the sunrise on Primrose Hill at 4:43am. Join us for a ride from Brixton to the Madeira cafe at 1 Wootton St London SE1 8TG (near Waterloo) for breakfast. We are holding a pedal powered film showing in the new Windrush Square on Wednesday 23rd June. We are projecting on the Bovril building and will be showing Belleville Rendezvous. It will be completely powered by bike so please come alomng and pedal! We will be hosting an evening of open-air bike related films. In contrast to Somerset House's season ours will be shown in the back garden of a post-war terrace in Vauxhall. However, what we lack in grand scale and excess we will make up for with the quality of the films. The show will feature shorts before the main film "Breaking Away". Seventeenth Century Cycling and Sketching Spectacular! A day-long cycling and sketching tour that celebrates Baroque Architecture and Sculpture in London. This tour proves that London has grand, Rome-like, moments throughout the city. The ride takes in the major works of the Baroque architecture and sculpture, with relaxing breaks at some of the highlights, offering plenty of time to sketch those curves. 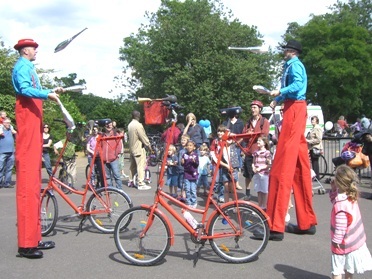 We are supporting a Lambeth-wide event which promises a leisurely cycle around our borough. Everyone's invited to join in this family-friendly fun ride that takes in many of the best sights in Lambeth. Organised by Lambeth Council's School Travel Team, all schools and their families in Lambeth have been invited to take part! You can start your ride at any point on the specially signed route that takes in Larkhall Park, Clapham Common, Brockwell Park, Myatts Fields Park, Kennington Park and the Albert Emmbankment. The full route is a half-marathon – setting a real but achievable target of 13.1 miles, much easier by bike than by foot! There are even two options for shorter routes if the energy starts to flag. Join us and participants in the London festival of Architecture for a lesiurely ride around some of London's most significant railway stations. The ride will finish around 4pm and take in lunch in a railway themed pub. Lambeth Council are running Dr Bike sessions every Tuesday evening though May, June, July and September. At the Dr Bike sessions you can get basic adjustments and repairs to your bike carried out for free. Many of the events will also offer you the chance to see what it looks like from the inside of an HGV vehicle to avoid cycling into the driver’s blind spots.